When I head out to the Celery Bog I am usually pretty focused on the wildlife. I look to the sky at times, but it is to track something flying over. Imagine my surprise when I saw that this plane flying in the early morning light. Whenever I am on a shoot I want to make a good photo as fast as I can. That kind of takes the pressure off a bit. Making this photo just after getting out of my car made for a fun shoot. 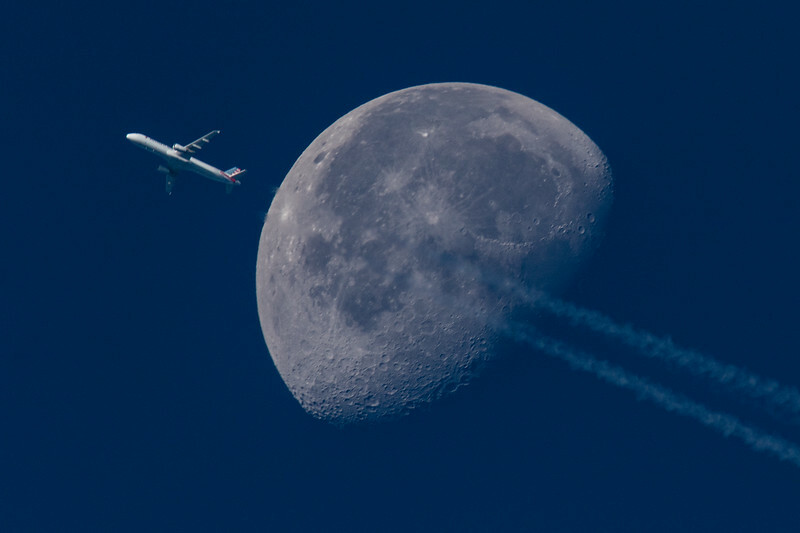 When I saw this plane I knew that it would cross over the moon. The only problem was that I had just gotten out of my car, and my camera was in the far back. I ran back there and yanked the back hatch open. I made a guess on exposure and threw the lens up. I just missed the plane crossing, but I was able to make this picture. It is one that I like because it is different than my normal moon photos. With the 600mm lens coming into my possession I wanted to make more moon photos. This was a good start to that goal.